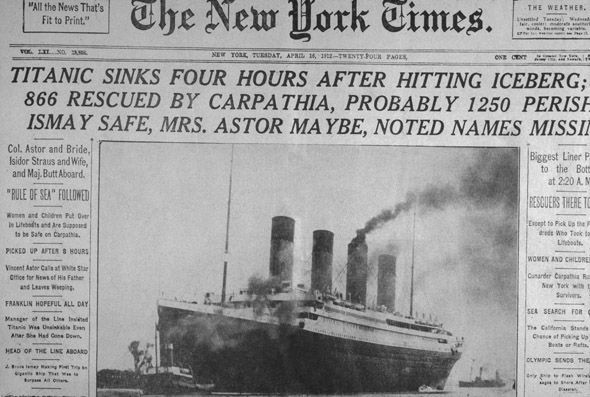 Monday marked the 107th anniversary of the sinking of the RMS Titanic (April 15, 1912) and I thought I’d revisit the overall weather pattern that played a key role in the tragedy. By studying weather maps and written records from that time period, some definitive conclusions can be drawn about the weather during the trip across the Atlantic, and there are also some interesting relatively new theories involving atmospheric conditions and their possible effects. First off, the voyage started off with fine weather for the first three days including light winds and mild temperatures. However, by the last night of the fateful trip, a strong cold front sweeping off the east coast of Canada, moved through that part of the North Atlantic and the temperatures dropped from the lows 40’s to near freezing in just a few hours as the ship entered an area of Arctic high pressure (surface map). Skies were relatively clear and the stars could be seen rather easily as the moon was in a “new moon” phase. While the seas were relatively calm, a NW flow of air developed behind the front and actually steered a giant ice field towards the ship that night. Finally, at about 20 minutes before midnight, the ship hit an iceberg that has been estimated as possibly weighing up to 300,000 tons, and the ship’s hull was torn open. It then took less than three hours from that point on for the Titanic to sink and there were, of course, too few life rafts for all of the people on board. The temperature of the water was estimated to be as low as 28 degrees – even lower than the conventional 32 degree freezing point as salt helped to lower its freezing point. Recently, there have been more unconventional theories about nature’s role in the sinking of the Titanic. For example, a recent study suggests that the nearness of the Earth to the Moon and Sun – a proximity not matched in more than 1,000 years – resulted in record tides that help explain why the Titanic encountered so much ice. Specifically, the nearness of the Earth to the Sun and Moon enhanced their gravitational pulls on the ocean and produced record tides in the weeks before the disaster. It is suggested that these record high tides refloated masses of icebergs traditionally stuck along the coastlines of Labrador and Newfoundland and sent them adrift into the North Atlantic shipping lanes. Additionally, a second theory regarding nature’s role in the disaster contends that the icy waters created ideal conditions for an unusual cold water type mirage called a superior mirage. A superior mirage would act to bend light rays downward resulting in warped images which may have confused nearby ships trying to help with rescue efforts and could explain why icebergs may have been temporarily hidden from the lookouts on the ship that night (mirage diagram). A superior mirage occurs when warmer, less dense air sits atop colder, more dense air – a condition known as a temperature inversion. This is the opposite of the more familiar “desert mirage” atmospheric scenario in which case the surface is very hot causing light to bend upward towards the sky which then shows the sky on the ground that looks like water. One piece of evidence that a temperature inversion existed that fateful night has to do with the fact that some of the life boat survivors recalled seeing a smoke plume “flatten” as it rose from the Titanic to a certain height. This is typical in an inversion since as the smoke plume reaches a stable layer in the atmosphere it tends to “flatten” out rather than continuing to rise. The superior mirage theory suggests that the freighter SS Californian was unable to identify the Titanic on the moonless night because even though the Titanic sailed into the Californian's view, it appeared to the crew on that ship to be too small to be the great ocean liner. Also, the crew on the SS Californian testified later that they weren’t quite sure what they were seeing on the horizon when the Titanic was shooting distress rockets into the air. 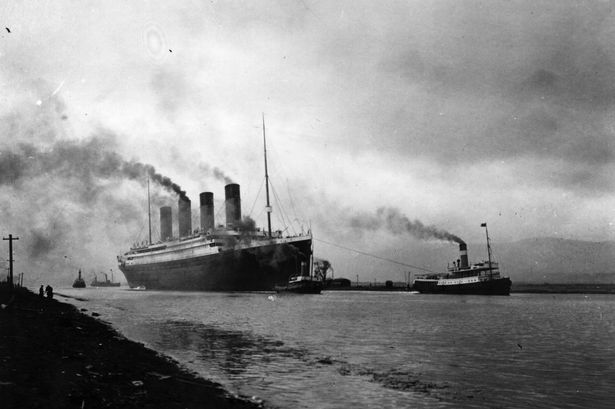 The Titanic’s rockets appeared quite low in the sky – perhaps as a result of a superior mirage – not at the higher heights that the crew would have expected if indeed they were distress signals. Finally, the superior mirage may have also disrupted signals sent by the Titanic to the SS Californian with a powerful electric Morse lamp as the crew later reported that the carefully timed flashes arrived distorted and jumbled. History will never know exactly what events and conditions precipitated the Titanic disaster, but the mirage theory is backed by some eyewitness accounts and raw meteorological data. One last note, in a strange twist to this story, the SS Californian actually suffered a similar fate as the Titanic as it was sunk during World War 1 (November 9th, 1915) by a German submarine in the eastern Mediterranean Sea. One person lost their life and the ship has never been found.